This is a really great little 5 1/2 inch high Nancy Ann Story Book Doll made in approximately 1952. 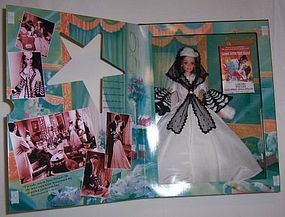 She is signed on the back STORY BOOK DOLLS U.S.A. TRADEMARK REG. She has black sleepy eyes, is fully jointed with auburn glued on wig. Her original white and blue dress and slip are in very good condition. She has the black painted on shoes on her feet. We guarantee all items to be as described. THANK YOU. This is a really great little 5 1/2 inch high Nancy Ann Story Book Doll made in approximately 1952. She is signed on the back STORY BOOK DOLLS U.S.A. TRADEMARK REG. She has black sleepy eyes, is fully jointed with blond glued on wig. Her original yellow dress and slip are in very good condition. She has the black painted on shoes on her feet. We guarantee all items to be as described. THANK YOU. 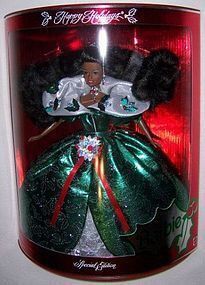 This is a really pretty 1995 Black Happy Holiday Barbie Doll with black hair, mint, unused condition in the original, unopened, box made by Mattel. 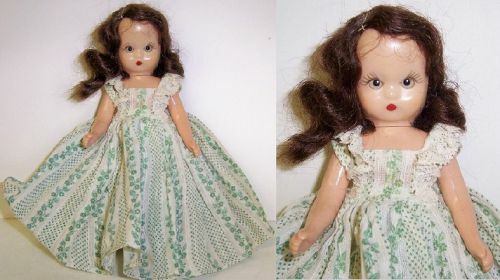 This pretty doll has a really pretty green dress with white collar and holly decorations. The box is in very good condition with no damage. 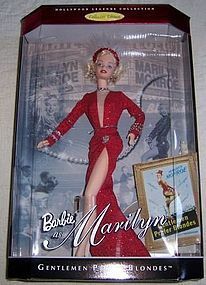 Be sure to search our other Barbie Dolls available. We guarantee all items to be as described. Feel free to email any questions. THANK YOU. This is a really pretty 1994 Timeless Creation White Scarlett Barbie Doll, mint, unused condition in the original bi-fold box made by Mattel. This pretty 11 1/2 inch doll has the beautiful white with black accents and fur muff Honeymoon Dress from the movie Gone With The Wind. The box is in very good condition with no damage. We guarantee all items to be as described. Feel free to email any questions. THANK YOU. 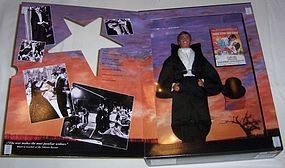 This is a really great 1994 Timeless Creation White Rhett Butler Ken Doll, mint, unused condition in the original bi-fold box made by Mattel. This 11 1/2 inch doll has the stunning black Suit with Cape, hat, white vest and fancy shirt from the Honeymoon scenes of the movie Gone With The Wind. The box is in very good condition with no damage. Be sure to search our other dolls available. We guarantee all items to be as described. Feel free to email any questions. THANK YOU. This is a really pretty 1993 White 35th Anniversary Barbie Doll with Brunette hair, mint, unused condition in the original, unopened, box made by Mattel. This pretty doll is a Reproduction of the 1959 Barbie with the black and white stripe bathing suit, sunglasses, heels, doll box and the famous ponytail. The store box is in very good condition with no damage. We guarantee all items to be as described. Feel free to email any questions. THANK YOU. 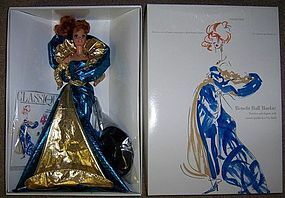 This is a really pretty 1989 White Army American Beauties Collection Limited Edition Barbie Doll, mint, unused condition in the original, unopened, box made by Mattel. This pretty doll has a really great Army Uniform on with hat and skirt in the box. The box is in very good condition with no damage. We guarantee all items to be as described. Feel free to email any questions. THANK YOU. This is a really pretty 1993 White 35th Anniversary Barbie Doll, mint, unused condition in the original, unopened, box made by Mattel. This pretty doll is a Reproduction of the 1959 Barbie with the black and white stripe bathing suit, sunglasses, heels, doll box and the famous blonde ponytail. The store box is in very good condition with no damage. Be sure to search our other dolls available. We guarantee all items to be as described. Feel free to email with any questions. THANK YOU. 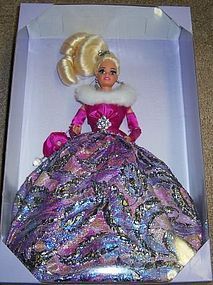 This is a really pretty 1992 Benefit Ball Barbie Doll, mint, unused condition in the original box made by Mattel. 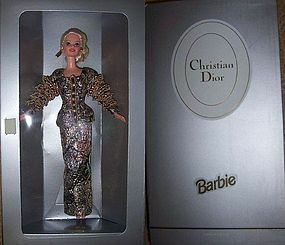 This Limited Edition Barbie is 1st In the Series. 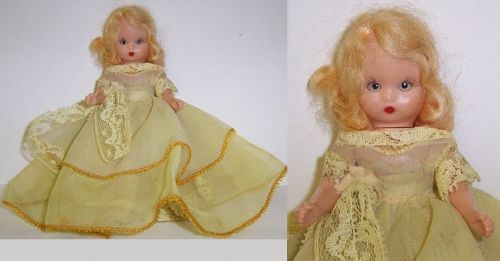 This pretty doll has a really pretty blue and gold gown on. She has auburn hair and real eye lashes. The box is in very good condition with no damage. Be sure to see our other dolls available. We guarantee all items to be as described. Feel free to email with any questions. THANK YOU.